When I seen this article I knew I had to share it. I think this is something that people should really be concerned with. I read articles years ago about schools in England being concerned about WiFi in schools and the effects on the children. This article from Mercola.com shares the same concerns. A Council of Europe committee examined evidence that the cell phones and wireless internet connections have “potentially harmful” effects on humans, and decided that immediate action was required to protect children. 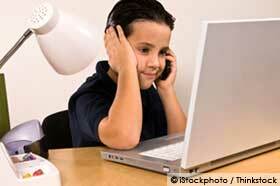 They ruled that the technologies pose a health risk and should be banned from schools. The committee report argued that it was crucial to avoid repeating the mistakes made when public health officials failed to recognize the dangers of asbestos, tobacco smoking and lead. The powerful Council of Europe Parliamentary Assembly has echoed the warning I have been making for years now, that children should be protected from cell phones and “one must respect the precautionary principle” in regard to cell phones and other wireless technologies. “… non-ionizing frequencies, be they sourced from extremely low frequencies, power lines or certain high frequency waves used in the fields of radar, telecommunications and mobile telephony, appear to have more or less potentially harmful, non-thermal, biological effects on plants, insects and animals, as well as the human body when exposed to levels that are below the official threshold values. If you are not yet aware of the increased risks to children from cell phones, I suggest viewing this graphic from the University of Pittsburgh Cancer Institute, which is based on research by Oh Ghandi, PhD at the University of Utah. It shows quite clearly that electromagnetic fields are likely to penetrate the brain far more deeply for children than adults. In fact, due to their thinner skulls, smaller brains and softer brain tissue, children are FAR more susceptible to damage from cell phone use than adults. Despite this, some schools in the United States have even allowed the installation of cell phone towers directly on school grounds! They are accepting large amounts of money from cell phone companies to do this, helping their budgets, but unfortunately locking them into long-term contracts they will not be able to break once they realize there are serious health hazards. Cell phones have been widely used for only about a decade, so we haven’t even hit the tip of the iceberg in terms of the REAL effects of this radiation exposure. If cell phone popularity continues at its current rate—or increases, which is likely—we could be headed for a brain cancer epidemic the likes of which the world has never seen. Of course, not everyone who smokes gets lung cancer, and not every cell phone user will develop brain cancer or suffer neurological damage. There are many variables that contribute to your susceptibility. Why gamble with your life or the life of your child? You may be surprised to learn that several countries including France, Germany and India have already issued recommendations to limit exposure to electromagnetic fields, including those from cell phones and other wireless technologies. This includes Toronto’s Department of Public Health, which has advised teenagers and young children to limit their use of cell phones to avoid potential health risks. In the case of cell phones and wireless technologies, there is more than credible evidence that a hazard exists, and immediate steps should be taken to prevent further exposure. One of the most important points made by the European Council report, which most mainstream studies attempt to downplay or completely ignore, is the fact that the latency period for brain tumors from cell phone use may be three to four decades. “Obviously, in evolutionary terms, living or working in artificial electromagnetic extremely low frequency and high frequency fields, on top of the electromagnetic fields naturally occurring in the environment, is still a relatively new experience for human beings, fauna and flora. It goes back no further than fifty years or so, when intensive industrial and domestic exposure began with radars, radio waves and televisions and electromagnetic fields generated by high-voltage lines and household electrical appliances. So many current studies showing “no risk” from cell phone use are flawed because they’re focused on the short term — too short to predict the real heath outcome for heavy users who start using the technology at an early age. For example, Devra Davis, PhD, of the Environmental Health Trust, has also pointed out the danger of believing the media spin of a European study published in 2009 that proclaimed cell phones safe. In that study, researchers analyzed annual incidence rates of two types of brain tumors — glioma and meningioma — among adults aged 20 to 79 from Denmark, Finland, Norway, and Sweden from 1974 to 2003. But they did NOT tie these trends in any way to actual patterns of use of cell phones! It has taken almost a century for smoking to morph from a popular, seemingly sophisticated and “harmless” practice into what’s now regarded as a nasty habit that will lead you to an early grave. It took decades of cancer deaths for the truth to finally meet the public’s eye. In the same way the dangers of smoking were downplayed and ignored for so many years, the adverse effects of cell phone radiation are not acknowledged by the media, and therefore remain unknown to the majority of consumers. Despite what you may have heard, the link between cell phone use and brain tumors is well substantiated and backed by more than 100 scientific studies. There are now numerous peer-reviewed published studies showing harm. For a great overview of the latest research that helps explain the mechanism that causes damage to cells and DNA, please see this recent article featuring Martin Blank, PhD of Columbia University. And for a more comprehensive summary of the science see the Electrosensitivity Primer, developed for physicians by Michael Bevington in the U.K., which documents hundreds of studies, or the legendary Ecolog Report, commissioned by T-Mobile and Deutsche Telecom MobilNet GmbH. This report offers an extensive, well-organized summary of the known biological effects from microwave radiation, as does the BioInitiave Report, much of which was later published in Pathophysiology. All the evidence points to the fact that our current safety standards are seriously inappropriate to protect you and your family. It is beginning to be more widely accepted that our rapidly expanding wireless technologies must be properly evaluated, first of all, and the precautionary principle must be invoked when new technologies emerge. Children Should Always Avoid Using Cell Phones: Barring a life-threatening emergency, children should not use a cell phone, or a wireless device of any type. Children are far more vulnerable to cell phone radiation than adults because of their thinner skull bones and also because they have not yet completed their child-bearing years. If you are in a meeting, on public transportation, in a courtroom or other public places, such as a doctor’s office, keep your cell phone turned off out of consideration for the ‘second hand radiation’ effects. Children are also more vulnerable, so please avoid using your cell phone near children. Use a Safe Headset Technology: Wired headsets will certainly allow you to keep the cell phone farther away from your body. However, if a wired headset is not well-shielded — and most of them are not — the wire itself acts as an antenna attracting ambient information carrying radio waves and transmitting radiation directly to your brain.